I'm very excited about my new release. 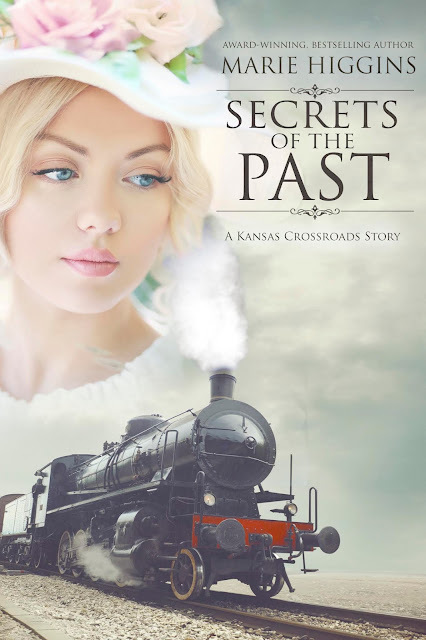 A couple of months ago, Amelia Adams approached me and asked if I wanted to write a story for her bestselling historical western romance series, "Kansas Crossroads". 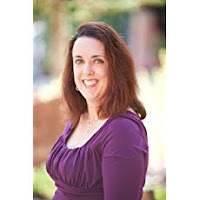 I was THRILLED that she asked me since anyone who reads clean historical romance knows how popular Amelia Adams' stories are. Well, now my story is out!! THANK YOU, AMELIA! On KINDLE and KINDLE UNLIMITED!! Texas Ranger, Wyatt Donovan comes to Topeka, Kansas, to face his past heartaches. 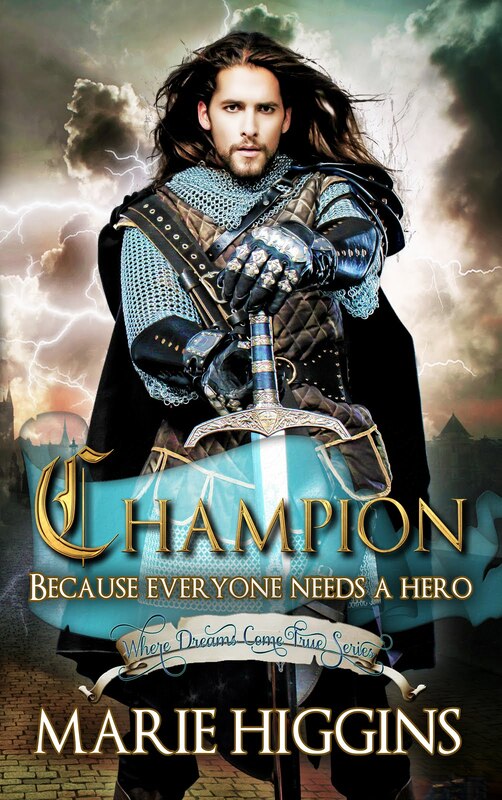 When he meets his childhood friend’s sister after thirteen years, he’s more than ready to become the hero she sees in him. Josette Allen was always an odd girl, but as a woman, her inquisitive mind makes the town believe she’s insane. When her childhood crush saunters into town, stirring up old feelings, Josie is ready to catch his eye. Unfortunately, the only thing she’s good at catching is mayhem. Will she ever be the reason he has stars in his eyes… or will she always be the thorn in his side? Bone-weary after yet another hard day’s ride, Sergeant Wyatt Donovan collapsed onto his bedroll before the crackling orange flames. The warm glow did little to ease the chill from his bones. Wyatt gave James a nod. No doubt he’d traded with some Yankee. Wyatt took his first bite of beans in over a year and sighed. Pure bliss. At the moment he didn’t particularly care if the devil himself provided the gift. He relaxed against the bedroll propped next to the saddle, resting his head, and let the hot food warm him from the inside out. He took another bite and reached into his saddlebag, withdrawing the battered letter he’d received that morning. Mail was just as scarce as beans and he wanted to savor the irony of having both at once. “Is the letter from that pretty little wife of yours?” James plunked down beside him with a suggestive wink. “I don’t know. Give it back and we’ll find out.” Wyatt yanked the envelope back. “Your father sent the letter over four months ago,” he scoffed. “All right, all right.” Wyatt shifted his gaze down the page. “Dear Wyatt.” He paused for dramatic effect, purely to torment his friend, and grinned. Numb, Wyatt flicked his gaze back over the words. No! It couldn’t be true. He read the missive a third time. 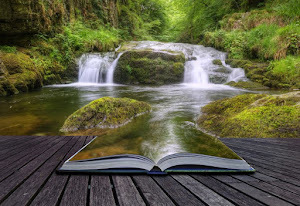 His stomach clenched, and the page trembled in his grasp. 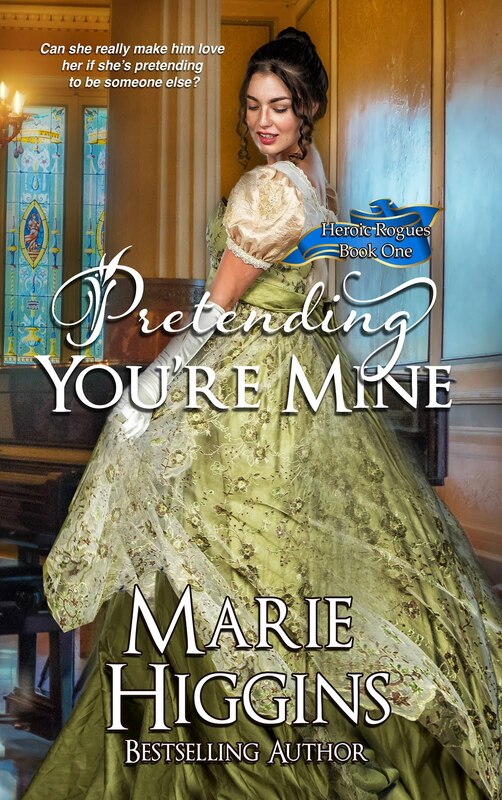 Come back to me, Wyatt… Marjorie’s lilting voice rang through his mind as clearly as if she were standing beside him. He could more than hear her, he could smell the exact scent of lilac in her hair and see the amber of her eyes. Numbness gave way to denial. She wasn’t dead. She couldn’t be. Not for four months. If Marjorie was truly gone, he would feel it. She was a part of his soul. If she died, a piece of him went with her. But he was still whole… wasn’t he? “No, God. Please, no!” Denial dissolved into anguish. He was the one fighting a war. He was supposed to die. Not Marjorie. Never Marjorie. Fiery red-hot anger burned within him, twisting and contorting until the sliver of his soul belonging to Marjorie and no other broke off and slipped away, leaving nothing but pain in its wake. The collar of his butternut jacket tightened, and he couldn’t breathe. Shaking with rage, Wyatt stood, wadding the miserable missive. The hot beans spilled down the front of his trousers. He didn’t care. James wrenched the crumpled paper from his fingers, smoothed out the wrinkles and skimmed the paper. His face turned pale and tears gathered in his eyes. “Wyatt, I… I’m so sorry,” he murmured after a few moments in a shaky voice. “I don’t know what to say.” Gently he refolded the letter, handing it back to Wyatt. With a nod, James threw the crumpled note into the fire. 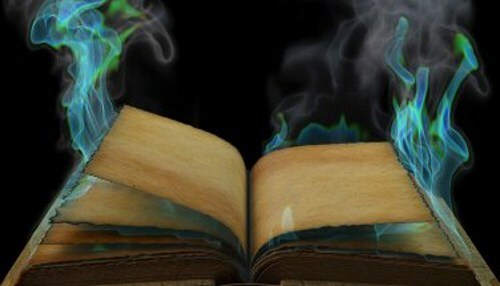 Instantly the flames licked the edges of the paper, obliterating all evidence. Unfortunately, the truth was not so easily banished and as the last ashes disappeared, so did every hope and dream he’d nurtured for his marriage. Wyatt vowed never to fall in love again. The pain of losing someone was too unbearable. Stepping off the train, Wyatt Donovan’s cold heart refused to make him feel anything about his hometown. Releasing a deep sigh, Wyatt slowly scanned his gaze down Main Street. Topeka was still as dusty as he remembered. Then again, some things never change. However, one thing was different. The large two-storied hotel that was about ready to fall apart when he’d left town all those years ago, appeared to have been remodeled into a new hotel. The Brody Hotel. He was impressed with the changes, and he especially liked the updated wrap-around porch in front. 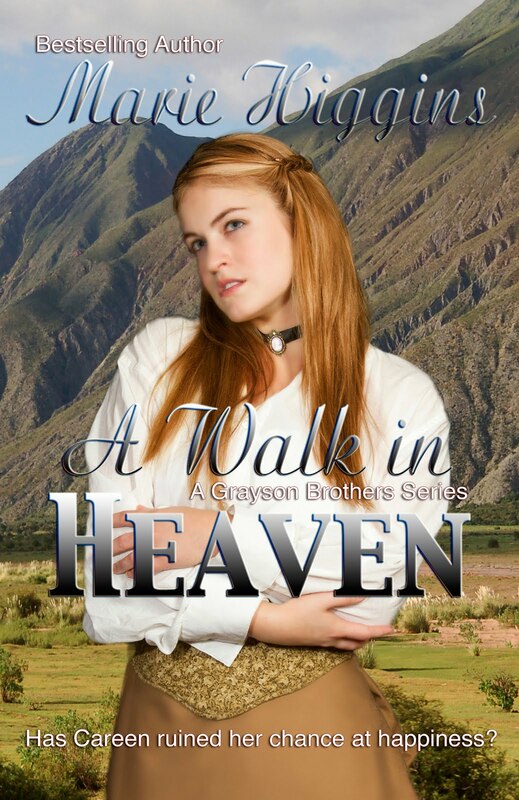 Wyatt gripped his satchel and continued moving toward the hotel. He shifted his attention to Main Street. The shops lining both sides of the road were busier than when he lived here as a young boy, and many people were hurrying from one place to the other. As usual, old widows and spinsters gathered in front of the milliner’s shop, twittering about anything and anyone. Young men perched along the front of the Silver Dollar Saloon with one foot propped on the boardwalk and the other on the dirt road in front, thumbs in their front pockets. They watched the young ladies stroll in front of them, twirling parasols to shade their faces. The apple pies baking inside Charlotte’s Eatery wafted through the hot breeze as their sweet scent filled his nostrils. His homecoming should be joyful, but it wasn’t. Pain wrenched at his chest like a bullet to the heart. He hadn’t been back since he’d visited Marjorie’s grave right after the war ended. The visit was short, but he left quickly as he didn’t want to wallow in his misery. This blasted town had taken away his childhood, forcing him to become an adult faster than anticipated when he was only eleven years old and his parents died. Once he’d moved to Missouri with his older brother, Wyatt vowed never to step foot in Topeka again. He’d joined the Texas Rangers not long after the war ended, and he’d hoped that working for them would help bury the pieces of his shattered life and allow him to go forward. For a while, he’d been content chasing down outlaws with the other Rangers. Now the outlaws were the reason he was back in Topeka. The clamoring of small feet shook the boardwalk, mere seconds before two little scamps knocked into him. He teetered, but quickly regained his balance and stepped out of the way. The two boys darted into the street, taking turns as they playfully shoved each other back and forth. Their smiles grew larger as the seconds passed by. Across the street at the Mercantile, their mother called them home for supper. Grumbling, they sluggishly walked back toward the store with drooping shoulders and long faces. Recalling the days after he’d moved to Missouri, Wyatt chuckled. His first and forever friend had been James Allen. They were inseparable as young men… and always in some kind of trouble. After he and James had joined the war, Dr. Allen had moved his practice to Topeka. On impulse, he lifted his gaze toward the shops, searching for the doctor’s office. Wyatt had been there once, the day he’d come to see Marjorie’s grave, and he hadn’t been back since. James would be surprised to see him, but not as surprised as when Wyatt offered him a position working for the Texas Rangers. Curiosity moved Wyatt’s feet as he headed toward the building where the doctor’s sign hung haphazardly above the door. Memories flooded his mind as a pang of homesickness crawled into his belly. What had become of his friend? Since the war ended, the little contact they’d first maintained had dwindled over time and eventually died. In truth, any reminders of when he’d met, fallen in love, and married Marjorie had proved unbearable, and Wyatt had slowly stopped writing to James. From out of nowhere, a loud boom shook the ground. Wyatt jumped, instinctively reaching for his pistol as he searched for the cause of the explosion. A black cloud of smoke billowed from the old barn behind the doctor’s office, pouring from the chimney and filtering through the windows. His heart sank, and panic surged through him. He needed to help. Images of his friend’s family screaming as their flesh burned flashed through his head, churning his stomach. Wyatt broke into a run. He pushed past people who stood in his way. A few had turned to look at the smoke, but they shrugged and went about their business without helping. Frustration grew inside his chest for their carelessness, but he couldn’t stop to ask questions now. When he reached the double-doors to the barn’s entry, the smoke didn’t appear as dark, but a metallic screech loud enough to wake the dead, ripped through the air, grating his eardrums. He yanked open the barriers and rushed inside. Smoke burned his eyes and he stopped short, unable to see six inches in front of his face. Choking on the black smoke, he waved a hand to clear the air, coughing. Slowly the room came into view and Wyatt glanced around the cluttered area. No flames danced across the walls, only smoke. Odd. A woman sat in the middle of the floor, staring at the large strange-looking contraption still sputtering and spewing small puffs of acrid smoke. The machine, bearing some resemblance to a steam locomotive, screeched and groaned like an injured animal caught in a trap. Little by little, the device quieted. Incoherent grumbles came from the woman as she aimed a murderous glare at the machine. Wavy long hair coated in soot, stuck out in odd shapes and different directions around her head. Cautiously he walked closer, and the floorboards creaked beneath his feet. The filthy woman jumped and twisted toward him with such agility he wondered if her bottom was connected permanently to the ground. Wide blue eyes stared at him, glowing against the soot covering her face. A gasp tore from her throat. Wyatt arched a brow. Strange woman. He swept his gaze over the boy’s clothes she wore, to her unruly dirty hair, back to her wide eyes. Her lips parted as her attention moved over him from the top of his Stetson to his dusty boots. She blinked a couple times, her fingers threading through the matted locks, or at least attempting to run through her hair. “Oh, good grief!” She buried her dirty face in her hands. The agonized moans coming from her had Wyatt moving to her side in three strides. Kneeling next to her, he placed his hand on her shoulder with gentle care. Once again, she jumped and pulled away. Her expression turned from sadness to embarrassment within moments. She continued staring at him. “Are you hurt?” he inquired again. “No.” Her voice squeaked. She stood and brushed the dirt off her boy’s pants. The trousers hugged her legs like a coat of paint. The shirt unbuttoned at her throat displayed a lot more skin than he thought proper. He rose to full height, realizing he stood a good head taller. She chuckled, although no humor laced her tone. “The only thing hurt is my pride.” Another swipe of her hand down her clothes then over her hair removed some of the soot, showing her hair color was, in fact, blonde. She lifted her gaze and looked at him. He narrowed his eyes, studying her closely. Her voice sounded slightly familiar. He stood inside the barn behind the doctor’s office that he’d assumed belonged to James’ family, which meant this slip of a girl could only be… Tarnation! “Josie? Is that you?” He moved closer, trying to see beneath her soot-caked face. When his fingers touched her cheek, she slapped his hand away. The humor of the situation tugged his lips into a smile. Josette Allen. The little scamp who’d followed him around like a lost puppy when he and James were young men now stood before him looking… well, she looked the same as she had when he and James enlisted in the war. Granted, her body fit the boys’ clothes much better, but her unkempt blonde hair and snippy attitude hadn’t changed a bit. “Darlin’? When have I ever been your darling?” She shook her head and walked to the odd-looking machine. She crouched and pulled switches. By now, the device had stopped its ruckus and only a whisper of smoke rose from the metal beast. “Point taken.” A filthy hand fluttered dismissively through the air though her eyes narrowed. Growling, she rose as her eyes turned a dark blue. She planted her hands on her hips as her chest heaved a quick rhythm. He stood as well. Josie threw her hands in the air and released another growl. She turned back to her contraption. Chuckling, he turned back to the opened barn door but stopped before taking another step. “One more thing before I go,” he said over his shoulder. A saloon? At this time of day? It was barely one o’clock in the afternoon. Just as he reached the door, she kicked the machine and grumbled. Biting his tongue, he dared not laugh or comment on her unladylike language. No doubt she’d gotten her patience from James. He turned back to Josie. She sat on the ground with her legs folded beneath her but kept her eyes averted toward the ceiling. Another groan tore from her throat as she shook her head. He’d always been able to get her bloomers in an uproar with that nickname. Funny, because it was more enjoyable now than before. Strange how time changed things. Wyatt found himself genuinely grinning as he walked toward the saloon. Silver Dollar Saloon had been in town since he was a boy. His father and his chums had left that place drunker than a skunk. Wyatt lost his grin. He hadn’t approved of his father’s drinking even when he was a young boy. Shaking his head, he pushed the memory aside. No use in thinking of the past now. It would only bring heartbreak. From behind the saloon, another commotion started, but nothing like the explosion that Josie had made. Instead, a woman’s wailing and men’s shouts pulled his attention to the alleyway. This time, people ran to see what had happened. Dread clutched at Wyatt’s heart and churned his stomach. He’d picked the right day to come to town since this was the very reason he’d volunteered to assist the town marshal in Topeka. He hurried through the alleyway toward the crowd at the wooded area behind the saloon. Two women stood crying into their hands, and four men knelt around a person lying between the trees – still as could be. The men lifted their heads and looked at him as they moved aside. When Wyatt strode closer, death’s foul stench hung in the air. The young woman – who probably wasn’t much older than twenty – wore a wrinkled nightdress and was somewhat wrapped in a white bed sheet. Her lips were blue, but her face, neck, and arms were white, making the blonde hair framing her face stand out more. Bile rose in his throat, and he gritted his teeth to keep it down. It was never easy to look at death no matter how the person left this world. “I did,” whispered the young man kneeling by her head. “She disappeared last night. I never thought…” He sobbed and placed his fisted hand to his mouth. Wyatt studied her closer, mainly her hands. Her nails were dirty, which struck him as odd since it appeared as she kept herself clean. He glanced on the ground around her, hoping to see anything that might indicate how she died. But the area was also clean. He lifted his gaze to the young man. Brown curly hair blew over his eyes as the wind teased each strand. “Are you related to the deceased?” Wyatt asked. The man shook his head. “No, but I’ll go fetch them now.” Tenderly, he lifted the dead girl’s hand and placed a kiss on her fingers. Tears streamed down his cheeks as he pulled away and stood. Emotion clogged Wyatt’s throat. He knew how this man felt. Wyatt wasn’t the first man to have his heart ripped from his chest and chopped into tiny pieces, and he wouldn’t be the last man to mourn for a loved one, either. The pain was as strong today as it had been when he’d read Dr. Allen’s letter almost thirteen years ago. 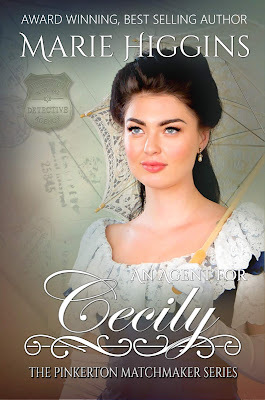 What had possibly made Wyatt agree to help the town marshal find the killer? He knew the dangers of opening old wounds. But he needed to know how Marjorie died, and to make the person responsible for killing her, finally pay. Zack Greyson was in the right place at the wrong time. Now he’s the FBI’s key witness in a human trafficking case against a U.S. Senator, and the senator’s henchmen are out to kill him. The FBI places Zack in protective custody and assures him they’ve sent their best agent to guard him… Or is Agent Whitney Lawson their worst agent? Because of her, Zack is discovered and they are both forced into hiding. With stakes running high in a life or death race to the trial, Zack and Whitney find their passions racing as well. Zack knows that one way or another he’s destined for entrapment… he just hopes it’s Whitney’s and not the wrong end of a bullet. So, she botched up an assignment. It hadn’t hurt anyone. Not really. To err is human, right? Agent Whitney Lawson tightened her fingers around the steering wheel as she drove slowly through John F. Kennedy International airport’s parking lot. She wasn’t here to catch a perp or even a suspect. Oh, no! That kind of assignment was way above her now. Two weeks ago she would have been undercover, or on a stakeout, or making arrests. Those were the important assignments. But now… she was a babysitter. Seriously! Although Zack Greyson was one of the country’s wealthiest men – according to a popular magazine – he wasn’t exactly a baby. Unless you were a love-crazy stalker and sighed baby-oh-baby, where have you been all my life when looking at his picture. Because Whitney messed up on an assignment two weeks ago, her boss forced her to play guard-dog to a billionaire. Zack was the key witness to the trial-of-the-year in New York City and was supposed to be in hiding. Senator Sterling had been arrested for conspiracy to commit murder, for fraud, and for running a human trafficking ring. Zack Greyson’s association with the senator had been ongoing for six years until Zack accidentally observed the senator commit two out of three of these charges. Zack was now in danger. The FBI had wanted the billionaire to enter their Witness Protection Program, but Zack had declined, stating he could hide just fine without having the FBI run his life. Whitney rolled her eyes. Just because the man had loads of money didn’t make him the Almighty and untouchable. The FBI suspected that the senator had put a hitman on his payroll, and her unit worried that Zack might wind up dead. She’d fought like crazy not to get this assignment, but obviously, had lost. It was now up to her to watch over Zack Greyson and make sure he was hiding well enough. But he wasn’t. If she could find him each time he moved locations, she was sure the hitman could find him. A movement from a parked truck caught her attention. She slowed her black SUV, watching carefully as the man exited his new Chevy truck. He reached into the uncovered bed of the vehicle and grasped a forest green wheelie suitcase. The popular celebrities’ magazines always used three words to describe him whenever they talked about Zack Greyson: tall, brawny, and gorgeous. She had her own way to describe him: arrogant, built-like-an-ox, and too conspicuous. For someone who was trying to stay hidden from the senator’s hitman, the billionaire failed miserably. He could have at least colored his hair or worn secondhand clothes instead of designer brands. 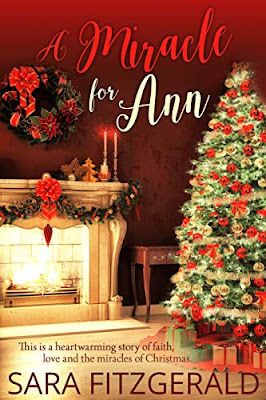 But Zack’s dark brown hair was still shoulder-length, he wore his usual classy, button-up long-sleeved shirts that somehow showed off his muscles – and drove top-of-the-line, brand-spanking-new vehicles. He grabbed a black leather jacket off the seat of his truck and shrugged it on before heading toward the terminal. Grumbling, she circled back around the lot, hoping to find a parking stall. She had to stop him from getting on the airplane. Hopefully, between now and just before he checked in, she’d think of something clever. There was no way she could keep an eye on him if he left New York City. Whitney found a parking place and scrambled out of the SUV as not to lose Zack. She probably looked suspicious by not having luggage, but she couldn’t worry about that right now. Her mind scrambled for a way to convince him that leaving the city was a bad thing right now, and that he really needed the FBI’s help. Throngs of people crowded the terminal. She groaned. Finding him would be harder now. Skimming her gaze around the different sections of the terminal, she noticed many loved ones saying good-bye to their families. Couples embraced and kissed before one of them left to enter the security section. Because Zack had a lot of money, he’d probably checked in online, which meant he’d be in line to check in his baggage. Yes! This was what he’d be doing right now, she just knew it. She pushed past people on her way to the baggage check-in desk. Thankfully, a long line of people stood waiting. And, standing taller than anyone was Zack Greyson. Whitney breathed easier as relief washed over her. But what should she do now? Would walking up to him and flashing her badge be the key to convincing him not to leave? He gave her one last hug before moving into the line. Whitney rolled her eyes. She’d bet twenty-bucks that Tommy never returned for his girlfriend. Men! She would never understand them. Suddenly, an idea struck her, and she sucked in a quick breath. Dare she do something so obnoxiously… stupid? But, she was desperate. She couldn’t botch another FBI assignment. She hurried toward Zack, trying to psyche herself up for the ridiculous play-acting she was about to perform. Three feet away from Zack, she let out a cry and screamed his name. Several people standing in line jumped and swung their gazes toward her. Zack looked over his shoulder, and when he saw her, his eyes widened. She wasn’t sure if he’d remember her from when her unit had talked with him two months ago, but she kept on with her performance, regardless. “Oh, Zack,” she sobbed and launched herself against him, wrapping her arms around his neck. She was taller than most of the women in her office, but she still had to raise up on tippy-toes in order to get in a good hug this way. Slowly, his arms wrapped around her waist as he brushed his lips over her ear. She wasn’t sure she liked how close their bodies were now… or the fact that he’d made goosebumps rise on her neck. “Why are you doing this?” he asked in a low voice. Once again, he lifted his head and peered down at her. This time, his gaze wandered over her face slowly as if he was trying to recognize her. There was a spark of interest in his teasing gaze, and she knew he’d figure out who she was eventually. “Darling, you know I have to leave,” he said grinning widely. She liked that he was following along, however, things were going the exact opposite of how she’d envisioned. This was not fun and games, so why was he playing like it was? “Please, Zack…” The tone of her voice became edgier. Whitney clenched her teeth. He’s got to be kidding! She wasn’t about to say that! Murmurs from the people behind her encouraged her to say those three magical words. What had she gotten herself into this time? As much as she detested what was happening, she reminded herself that she did this for the badge. She was a great FBI agent, and she would not mess up another assignment. Before she knew what he was doing – or could stop him – he lowered his mouth to hers. The second their lips touched, the small crowd around them cheered. Good grief! Was this really happening? Zack’s mouth moved slowly over her so gently, it took her breath away. Her heartbeat quickened and her legs suddenly grew weak. His strong arms tightened around her waist, holding her intimately against his body, and all she could do was let him kiss her. But she just couldn’t allow herself to get into the moment. He broke the kiss, and she sighed with relief. But when his mouth moved to her ear, his warm breath on her neck made her shiver with delight. Inwardly, she groaned. He couldn’t be serious… Yet, his mouth returned to hers and their kiss continued. Gads, he was really going to make her do this, wasn’t he? This is for the job! She tightened her arms around his neck and kissed him. In her mind she tried to imagine the most desirable man she’d ever met, but all she could picture was Zack’s face and his dreamy, twinkling brown eyes. His large hands slid over her back, caressing softly and bringing heat into her body until she relaxed. Against her better judgement, she participated in the bold kiss. What had started out to be a simple kiss, turned urgent. The velvety heat from his tongue caressing hers in the most inappropriate way made her mind whirl. In fact, she felt as if she floated in his arms. The sounds of cheering slowly diminished, and all she could hear was the erratic rhythm of her heartbeat. Just as she started to enjoy the kiss, Zack slowed down the urgency until only soft pecks were on her lips. He withdrew and stared deeply into her eyes. Dang, he was gorgeous. The phrase baby-oh-baby, where have you been all my life popped into her head. Snap out of it, Lawson! Blinking herself to awareness, she glanced around, preparing to meet the curious gazes of the crowd. But… they were not in line any longer. They were against a side wall in the corner. How did they get here? Anger grew inside of her, hot and unyielding. How she’d like to slap his arrogant face for making that comment. She huffed and shoved him away. The warmth she’d experienced being so close to him had disappeared, making her feel empty. She calmed her breathing, silently counting to ten. Zack continued to look at her wearing a slanted grin on his handsome face. He calmly folded his arms over his wide chest and tilted his head slightly. He grumbled and pulled out a rolled up magazine that had been in his jacket pocket. It was one of those popular tabloids. 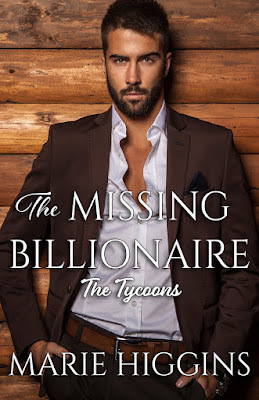 On the front cover in bold letters was written Missing Billionaire, and had his picture plastered across the cover. She rolled her eyes and tried not to feel embarrassed. Was he right? Would this be all over the media, now? Inwardly, she groaned. Captain Bott would have her badge for sure on this mistake. His hand gripped the handle, too. His piercing glare challenged her. Heat flooded her face, and she was sure it was redder then a ripe tomato. She needed to calm down and talk sensibly to him. That was the only way. Either that or tell him an enormous lie. Pushing past him, she led the way out of the terminal. Neither of them spoke as they neared her SUV, which happened to be closer than his truck. “My truck is just over there,” he said. Just as she opened her mouth to argue, gunshots popped through the air from out of nowhere. Her first instinct was to protect Zack. She grasped his arm, and pulled him down, ducking behind a parked car. She fished in the back of her slacks to pull out the gun from her holster. “Keep down,” she instructed, and she was relieved Zack did as he was told this time. With the gun in her hand, she peeked over the edge of the car. Whoever was shooting at them was hiding really well. She glanced toward her SUV. Only two vehicles away. They could get there. She’d make sure they arrived safely. She counted it out, and together they darted toward the SUV. More gunfire came from one direction, but thankfully, they made it to the vehicle and hopped inside. As quickly as she could, she started the car and took off. Seconds later, a white truck came into view, barreling toward them, picking up speed. Her heart sank. Out here in the airport parking, where were they going to hide? For more clean billionaire romances, CLICK HERE to see more stories in the series!